Home | Bird Supplies | Bird Toys from Parakeet to Macaws | Bird Toy Parts | Birdie Bagel Bird Toy Parts | Macaw/Cockatoo Birdie Bagel 5"
Home | Bird Toys from Parakeet to Macaws | Bird Toy Parts | Birdie Bagel Bird Toy Parts | Macaw/Cockatoo Birdie Bagel 5"
The ultimate in birdie bagels. This huge 5 inch cardboard round bagel is ideal for the Big Guys and Big Guys only!!! Made of non- toxic cardboard, this bagel can only be handled by the big guys. This is an all day shred and tear feast for your Cockatoo or Macaw. Macaw Birdie Bagels are 5" in diameter with a 4.25" center hole and 2" thick. 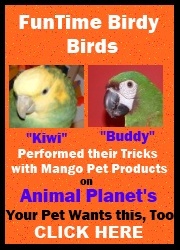 Ideal for larger Cockatoos and Macaws and all similar sized birds. Product Reviews for Macaw/Cockatoo Birdie Bagel 5"